This F3 model sports curly maple handle scales and a black Caswell finished blade. 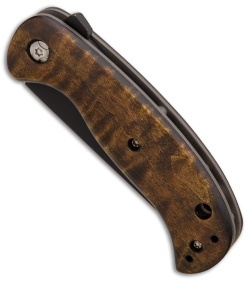 The F3 from Winkler Knives offers the durability of a Winkler fixed blade in a compact EDC folder. 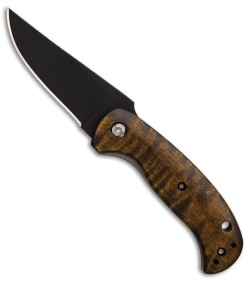 It has a blade made from 80CRV2 steel with a tough black Caswell finish. Curly maple scales provide a secure, comfortable grip and a classic look. 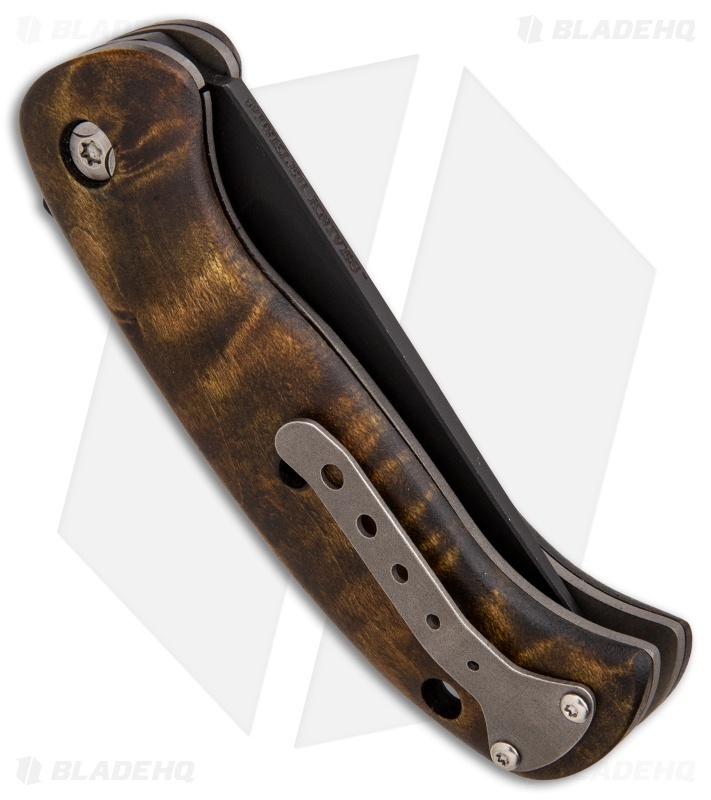 A reversible titanium pocket clip finishes off the solid EDC design. Ball-bearing pivot facilitates rapid blade deployment with the assistance of a flipper. Reversible tip-up pocket clip and flipper opener offer fully ambidextrous use. Titanium liner lock handle provides firm, dependable blade lock-up. I was possibly the first person to own one of these outside of Mr. Winkler and his employees, having received it under special circumstances back in March '17. This thing is a beast. It's extremely lightweight, and the pocket clip is pretty great, but I have to say, I didn't like that the wood wasn't stabilized in any way. The texture was excellent though, so maybe thats a trade off. The flipping action and detent were crisp and perfect, as was the fit and finish. The bearings definitely did their job but they were REALLY noisy, not sure why, I think its to do with the blade coating. Maybe they were ceramic though. I liked the ergonomics of the f1 better, although these were still decent. Overall, I liked it a lot, but it wasn't my style. I was too afraid of damaging or warping the wooden scales due to the humidity here in SoFlo.